The following guide can be used to help identify or correctly measure your UPVC / Composite Door Handle. If you would like further help identifying your handle, please print off and complete the PDF version of the Multi-Point Lock Identification and provide as much accurate information as possible via email to help@eurocell-hardware.co.uk. What are the Door Handle Dimensions? There are two critical dimensions when measuring your door handle - the PZ dimension and Screw to Screw dimension. You can browse our door handle section by PZ and Screw to Screw dimensions. Other useful dimensions include the top screw to spindle and overall back plate length. A. The PZ dimension - measured from the centre of the spindle (follower) hole to the centre of the euro cylinder hole. B. Screw to Screw (Fixing Centres)- measured from the centre of the top fixing screw hole to the centre of the bottom fixing screw. C. Top Screw to Spindle - measured from the centre of the top screw hole to the centre of the spindle (follower) hole. 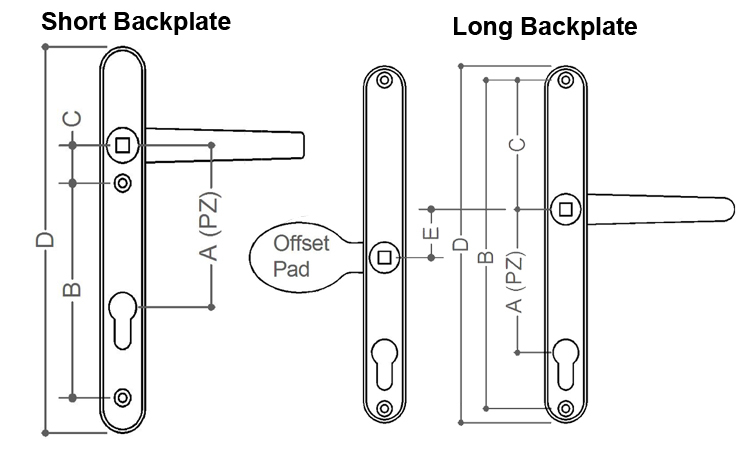 D. Overall Back Plate - the length of the back plate.